Located in rural Donaldson, IN, Catherine Kasper Life Center and the surrounding campus is nestled in a picturesque landscape overlooking Lake Gilbraith. Catherine Kasper Home (CKH) is a non-profit nursing care facility for individuals in need of assistance with daily living. 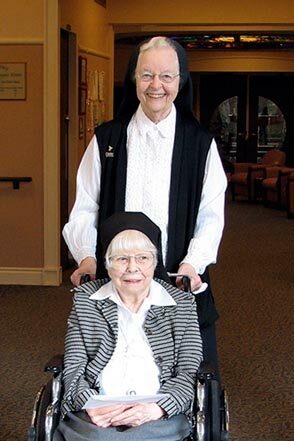 Our facility is part of Catherine Kasper Life Center, a faith-based community providing a wide range of holistic care services from independent living at the Maria Center apartments to skilled nursing care at Catherine Kasper Home. Spiritual Wellness: To promote the dignity of residents, Pastoral Care Services ministers in a holistic manner. Pastoral support is available to residents, family and friends. Pastoral Services are provided through daily Mass services and the Sacraments, non-denominational services and small group scripture reflection. Nursing Care: Nursing Care Services consists of caring and dedicated registered nurses, licensed practical nurses, and certified nursing assistants, providing quality care for residents. Therapy: Therapy Services utilizes qualified professionals to serve the occupational, physical and speech therapy needs. Each resident is assessed by a team of therapists to determine a personalized treatment program. Restorative Care: Restorative care assists residents in meeting individual goals and maintaining independence. Activity Services: Activity Services offers a wide variety of activities designed to meet the interests of the residents and increasing quality of life. Social Services: Social Services advocate on behalf of the resident, attends to psychosocial needs and promotes a sense of well being. Rehabilitation Services: Specialize in treatment of: orthopedic, (hip replacement, shoulder replacement), stroke rehabilitation, brain injury, neurological cases, Parkinson’s, lupus, pneumonia, balance issues, back pain, pain management, tendonitis, knee pain, ankle pain, wound care, and many other ailments.